WAIST HIGH: Piece By Piece. Now available through pre-order, Plexus Publishing will release Joy Division: Piece By Piece in January 2008. Joy Division: Piece By Piece is the definitive collection of writings on the legendary cult band, by their contemporary Paul Morley. 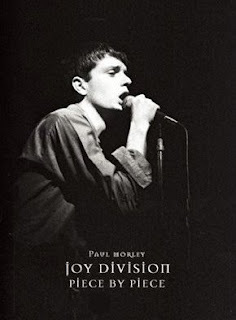 Collecting all Morley's classic articles and reviews from the late 1970s/early 1980s this book includes his obituary for charismatic epileptic vocalist Ian Curtis and his hindsight pieces on the significance of the band, framed by an extensive retrospective essay. Contemporary elements include Morley's critique of the films 24 Hour Party People - which told the story of the band's record label, Factory - and Control, the new Ian Curtis biopic, for which the author visited the set during production. Most movingly, Morley includes the original text that grew into his literary work Nothing, which parallels the suicide of Curtis with that of his own father. Paul Morley evokes the zeitgeist and the 'psycho-geography' of Manchester, which combined to produce the most uniquely intense rock group ever.